At The Sign Maker we make all kinds of signs and memorials. If you are unsure of exactly what you want, have a look at some of our gallery pages for inspiration. 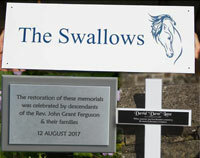 Every sign and memorial has been made to our customers specification. We have included details such as size, font, material etc. Lets us help you make you sign or memorial just the way you want it. 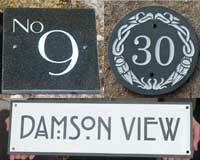 We use a lot of slate and other stone for house signs, business signs and memorials. The slate is stocked in various thicknesses and can be cut to any size. Personalised engraved door steps are quite unique. We also stock a lot of granite which again is used for signs and memorials. The two most popular granites are the black and the Celtic grey. The granite memorial wedges are available in these two colours. Other stone used include Purbeck stone, quartzite, limestone and marble. We do make a lot of house signs and every on is unique. You choose the size, the font, the letter colour, the material and an image if you would like them. This does make it a little difficult to choose one though - just so much choice! 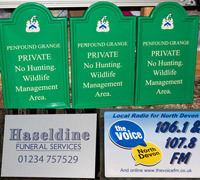 Have a look at this gallery of signs we have done for our customers to give you some ideas. It contains all the usual wood, slate cast metal etc. There are however some more unusual materials such as etched zinc and top quality polyurethane, both of which have raised letters, are long lasting and low maintenance. We understand that it is really important to have your memorial or memorial plaque made just perfect. Have a look at the gallery to find something you like. We cater for all budgets and whether you want a small brass memorial plaque, a granite wedge or a large cast bronze memorial the designers will do their best create it just the way you want it. How much choice can there be in choosing a wooden sign you may wonder. Lots actually, to start with which timber is best for you. Oak is very beautiful but must be maintained to keep the just made look, Iroko is full of oil and needs little maintenance. These are just two of the twelve timbers we use. After choosing the timber you must decide on font, layout letter colour etc. Our carpenters make the posts in different timbers and different styles and these can be painted or varnished. Our blacksmith creates a variety of wrought iron hanging brackets. Then there are the signs themselves which can be created in many different materials. 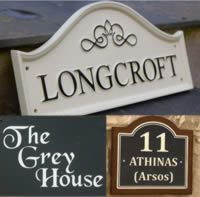 Have a look at this gallery page for ideas - both for house signs at the end of a drive or for business signs. Engraved plaques are used for many different purposes. They can be use for house signs, memorial, plaques and indeed for all kinds of business signs. We have a range of materials for engraving. Brass is the most traditional and the one most people think of first. There are lots of others though, many of which need far less maintenance. Have a look at the gallery - I am sure you will find something that you really like. Talk to our sales team for advice. This section contains a huge range of signs for business. Different signs suit different businesses. For you entrance sign we have fibreglass signs, aluminium tray signs, large wooden , cast polyurethane and painted signs to name but a few. There are also hanging signs, projecting signs, directional arrows, magnetic signs and banners. As well as all that we have a large range of notice boards, A-boards and sign boards in every shape and size!